Heels off, Boots on . . .
As a woman who has spent most of of her life around motorbikes, it would be a lie to say I had never been on one before (Ed: and journos never lie, right?). However, I would definitely not class myself as an expert when it comes to riding the things. So, when our editor went down to Devon before Christmas to try his hand at motocrossing, he then decided that I simply had to have a go myself. Therefore, last week I was woken up in the morning, instructed to pack an old T-shirt, slippers and any other bits and pieces I need and we jumped in the car and set off to Wheeldon. I could now give you a description of our night at a typical Devonshire pub where we participated in a quiz (still to this day I find myself wondering how ‘Hot Water’ can make a decent anagram of ‘Worth Tea’), but we all know you’re not here to read that. Though it does give you an idea of the sort of welcome you can expect - you really do get treated as one of the family. 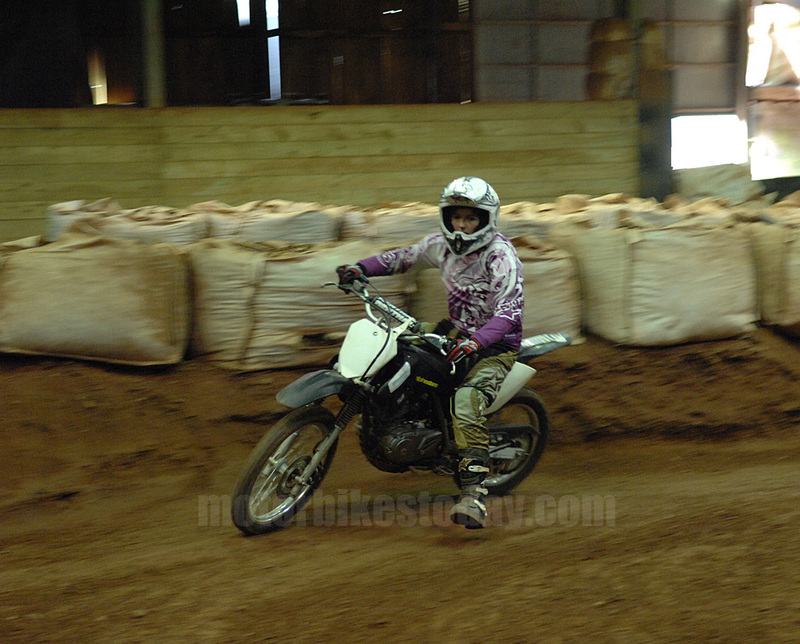 So, the next morning I woke up bright and early, got showered and wandered over to the barn next to our chalet, eager and ready to get on a motocrosser for the first time. First stage was in the barn to get kitted up. They had a huge range of sizes and provided knee armour, elbow protectors, a body shield, trousers and a top as well as the ordinary helmet, goggles, boots and gloves. There is no way that they won't be able to accomodate you unless you are particularly unusually proportioned. After going into the changing rooms and catching a glimpse of myself in the gear, it would be the understatement of the year to say I looked, or at least felt, anything less than a bit of a wally. However, I ignored the fashion statement and carried on outside to do a walk of the track with everybody else. Who, of course, were all dressed the same, which quickly dispelled any self-consciousness. This was also when my excitement quickly turned to nerves. I don’t know if any of you will have been that close to a dirt track before, but it is extremely daunting seeing how steep the jumps actually can be, and how tight some corners are, especially if you haven’t ridden in that style before. Once we had walked the track, we were given briefings according to our capability, me and another lady being treated as complete beginners, and then we were put straight on the bike to go around a test circuit. This is when we got to know our instructor, Andy, properly. Now I don’t mind telling you all that I was slightly cynical about being a young lady about to get on a motorbike in front of all these men who were definitely more experienced than I am. I had a horrible feeling that my day would be full of ridicule and chauvinism... and I was very, very wrong. I have never felt more at ease and safe than I did under Andy’s supervision; he was thorough and full of praise and, most importantly, immediately instilled complete trust. If he didn’t think we could do something, we didn’t get asked to do it, although as it turns out we were more than capable for anything he threw at us. We started off as four, all women at varying levels of novicedom. A few laps of the training course saw us whittled down to three as the fourth went off to play on the big track. A short while later it was just the two of us as the third also had enough experience on bikes and confidence off road to mix with the others. The other lady who remained in the group with me was more than just a novice to motorcycles, she had sat on her husband’s a few days before coming to the course and said ‘I don’t like it, get me off!’. 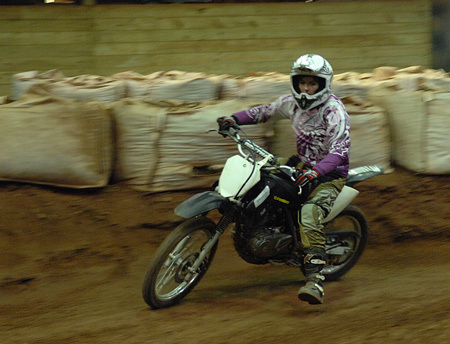 Having never even ridden pillion before, Andy had her going around the track, steering for herself with her feet on the foot pegs, using the throttle and even changing up and down the box like a veteran by the end of our training session. All of this in the space of just over two hours. Nerves are never something I have had to struggle with, but I couldn’t seem to shake them that day. Then I was told to try my first set of sharp turns and discovered that I’m not capable of turning right, and had my first crash. I’m not sure if it’s usual for somebody to lie on the floor shouting “Woo hoo! 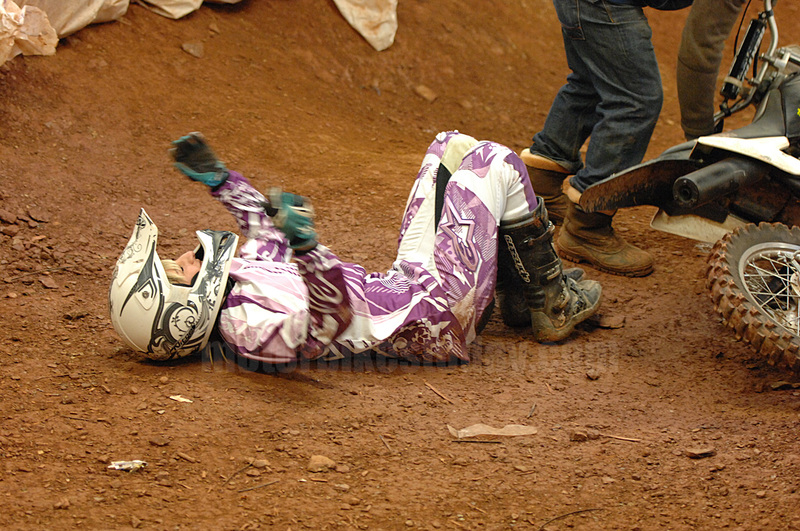 First crash of the session!” and giggle like an idiot...but hey, when have I ever claimed to be normal? After that, all my nerves flew straight out of the window and I tootled around the track very happily. Until Andy said, “Right! You’re ready for the big track”, that was. As if the thought of those jumps and dips weren’t daunting enough, British indoor motocross champion Tom Church had come down for a practice session, and watching him tear around the circuit without a second thought showed me how much I had to do to achieve that standard. There was no chance, but I was actually concerned about making an idiot of myself rather than missing out on a lap record. 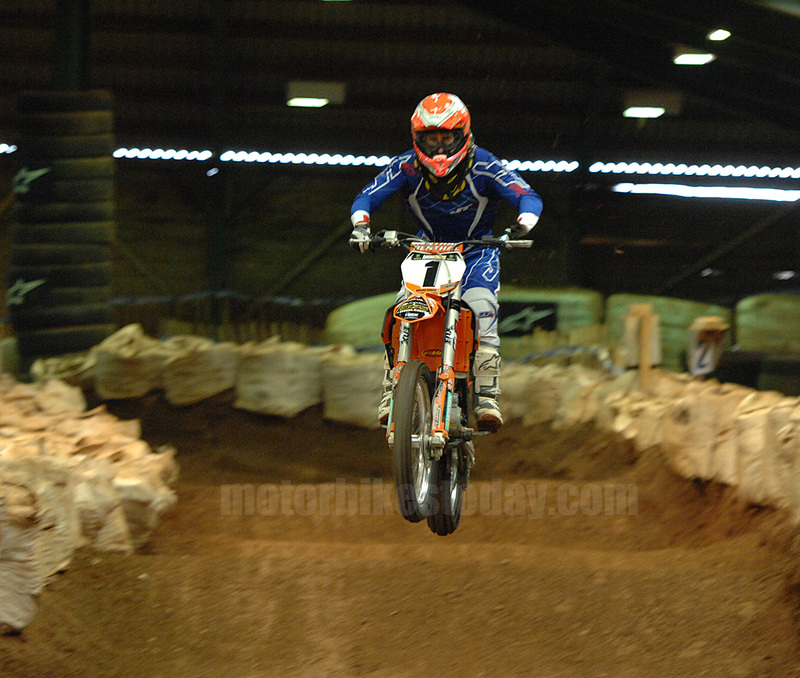 The moment had arrived, Andy called us out onto the track and we saw our bikes ready for us. He told us to get into second gear as soon as possible and to just trust our instincts; he said we’d be absolutely fine. Then we were off. I was absolutely fine, at first, I even managed the right hand turns, but then I approached the big hill. Andy was stood at the side, telling me to ease off the gas and just roll gently down, and I don’t think I have ever screamed so much in my life. Then that was it, I was addicted. We spent the next couple of hours going on and coming off the big circuit, and I became more and more confident with each lap I did, but by the time the lunch bell tolled we had all decided to call it a day, shaking our arms out with great difficulty. I wouldn’t class myself as unfit, I’m used to lots of exercise from my dancing, but I couldn’t move for days afterwards! So that’s all there is to say, really. 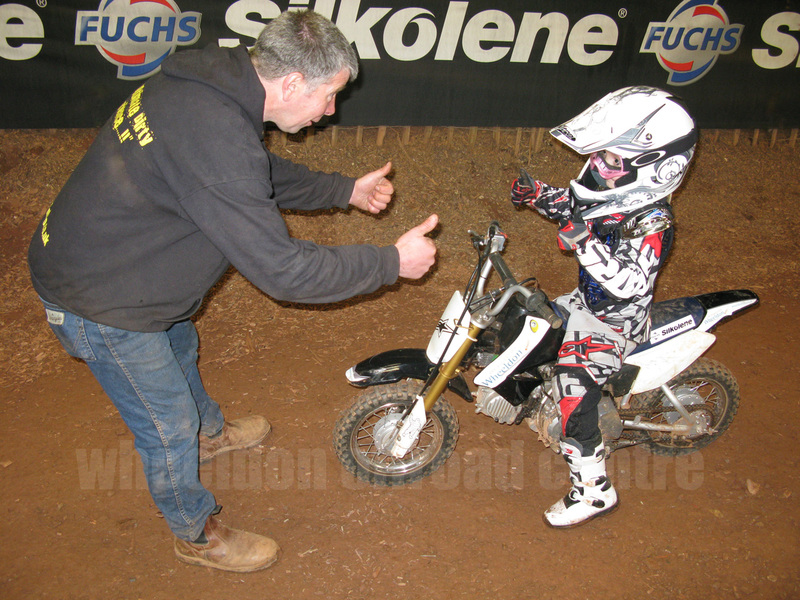 I’d highly recommend the Wheeldon off road centre to everybody, of all ages, all capabilities. It is truly an amazing day out, a huge confidence building exercise and one of the most safely run organisations I have ever come across. Please go, give it a try, and let us know how you get on! Editor's note: The foundation course that Laura did costs £125 for half a day full-on tuition. Lunch is provided, and self catering accomodation is available on site on a first come, first served basis for £55 each per night. Copyright © Motorbikestoday.com 2013. All rights reserved. Users may download and print extracts of content from this website for their own personal and non-commercial use only. Republication or redistribution of content, including by framing or similar means, is expressly prohibited without the prior written consent of Motorbikestoday.